5 Bedroom Detached House For Sale in Boston for Offers Over £330,000. With the build completed in 2017 and having been finished to a high specification, this five bedroom executive detached house offers the perfect family home. Split in to four levels separated by five stairs each, the property has a utility room, shower room an integral double garage on the ground floor, a large lounge diner and breakfast kitchen on the first floor, three double bedrooms, an en-suite and family bathroom to the second floor and a further single bedroom, master bedroom and en-suite to the fourth floor. Externally there is ample off road parking, a double garage and a large fully enclosed rear garden. Viewing is essential!! Double glazed window to rear. Comprising three piece suite of low level WC, double enclosure shower cubicle with wall-mounted thermostatic shower and vanity unit with inset sink. Heated towel rail, ceiling light point, extractor fan and continuation of tiled flooring. Double glazed windows to rear and side. Radiator, ceiling light point, power points, TV aerial point and French doors opening out onto raised patio area overlooking the garden. Double glazed window to side. Comprising three piece suite of concealed cistern WC, single enclosure shower cubicle with wall-mounted thermostatic shower and vanity unit with inset sink. Heated towel rail, ceiling light point, tiled flooring, extractor fan and shaving point. Double glazed windows to front and rear. Radiator, ceiling light point and power points. Double glazed window to rear. Comprising four piece suite of concealed cistern WC, panel bath with mixer tap, double enclosure shower cubicle with wall-mounted thermostatic shower and vanity unit with inset sink. Heated towel rail, ceiling light point, tiled flooring, extractor fan and shaving point. Double glazed window to side. Comprising three piece suite of concealed cistern WC, double enclosure shower cubicle with wall-mounted thermostatic shower and vanity unit with inset sink. Heated towel rail, ceiling light point, tiled flooring, extractor fan and shaving point. Double glazed Velux window to side. Radiator, ceiling light point and power points. Having two electric roller doors, power and lighting. Double glazed window to side and personnel door to rear providing access to rear garden. 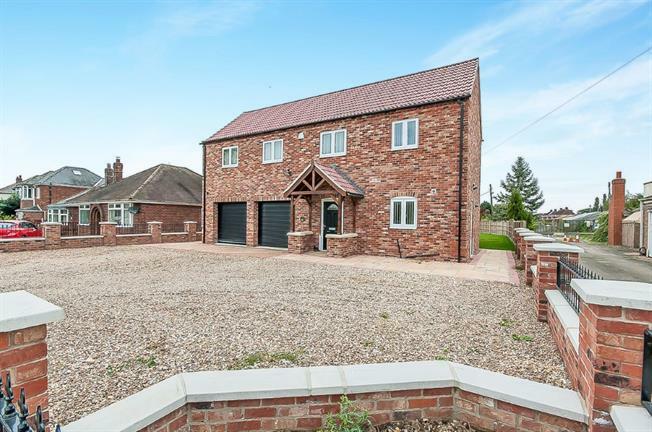 To the front of the property there is a spacious gravel driveway bordered by brick walling with iron railings, providing ample off road parking for several vehicles and access to an integral double garage. There are paved pathways to both sides providing access to the rear of the property and the garden which is bordered by timber fencing. In the majority laid to lawn with a central paved pathway, there is a brick staircase leading up to the raised patio area outside the lounge diner. Within the garden there is a brick built storage shed with a tiled roof and a paved seating area directly outside.